The world invests between $1.4 and $2.1 trillion in transport annually—but our understanding of how climate change will impact these assets, and how resilient this infrastructure will be, is still minimal. Countries–as their heads of state meet in Paris today–currently focus most of their efforts on the mitigation aspect of the climate equation, working to drive down their emissions. Yet given the size of the transport investments, and the existing effects of a changing climate, it is critical that climate resilience be built into the trillions of yearly investment. About 80 percent of the global population lives near a body of water, where transport operations are especially sensitive to rain and snow, temperature, winds, and limitations to visibility. These coastal cities—and those located on riverbeds—are at a heightened risk of increased sea levels and flash floods exacerbated by climate change. Increasingly, resilience is becoming a critical aspect of urban planning, as it affects an urbanizing global population and an interconnected economy. The costs of not factoring resilience into urban design can be extraordinarily high. For example, in the four years following Hurricane Katrina, the Mississippi Department of Transportation (DOT) spent about USD $1 billion removing debris, repairing highway and bridges, and rebuilding the Biloxi and Bay St. Louis. Moreover, the train company CSX spent USD $250 million to rebuild thirty miles of destroyed rail line. In sum, growth in urban areas, often centered in coastal regions, will necessarily have to consider resilience in planning, to avoid disproportionate costs as reactions to the reality of increased climate extremes. To convince ministers and investors to shift billions towards climate resilience projects, it’s critical to assign concrete values to resilience planning and adaptation, and thoroughly assess the consequences of not taking action. The cost to adapt to a world that is 2 degrees Celsius warmer is currently assessed to be in the $70-100 billion range by 2050. Further, as former NYC mayor Michael Bloomberg recently put it: all climate change is local. Indeed, the burden for locally tailored resilience planning will invariably fall on urban actors. For cities, 54 percent of the adaptation cost would go toward urban infrastructure, drainage and built public assets, 18 percent to railways, and 16 percent to roads. And while we know the breakdown of adaptation costs, we don’t yet know what the cost of inaction would be—only that it is significantly higher than the investment needed to prepare. Less-developed countries in Asia, Africa and Latin American and the Caribbean are already suffering from a changing climate. Experiencing stronger rainfalls, longer droughts, higher sea levels, as well as changes to local temperature patterns, these areas have fallen victim to the earliest human impacts of man made climate change. Increased rainfalls, droughts, and tidal surges are particularly straining the stability of transport systems in Africa and Latin America. Analyses of the Sub-Saharan African transport project estimate that an additional $5.2 billion is spent to maintain the approximately 20,000 km of paved primary roads because of the effects of climate change. 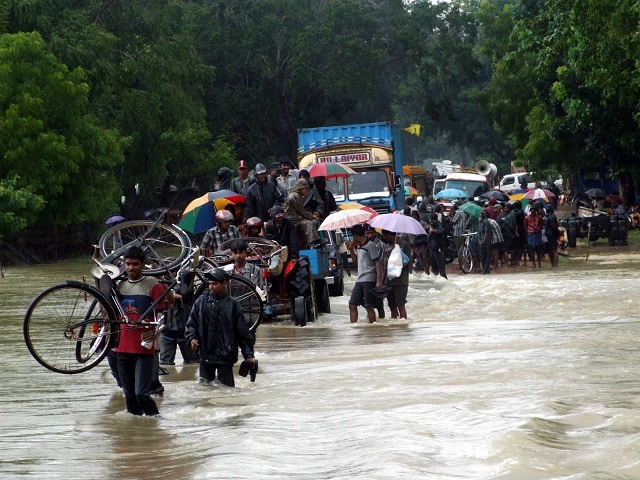 Planning for adaptation to the transport-specific impacts of climate change will lessen the financial shocks felt by developing economies, where climate impacts are becoming ever more urgent. The transport community is engaged in improving the global knowledge base on how to adapt to climate change. Ongoing efforts include guidance and toolkits for roads, railways, waterways and sector-wide approaches. WRI Ross Center for Sustainable Cities has been conducting workshops to build urban resilience in coastal communities, as well as work in Rio de Janeiro on integrating individual resilience into the city’s plan, Rio Resiliente. In Porto Alegre, work has been conducted more specifically on the intersection between transport and resilience planning, incorporating a targeted approach within a larger initiative aimed at capacity-building, city-wide. More work will be required. While eighty-four percent of the Intended Nationally Determined Contributions (INDCs) submitted towards a “Paris agreement” by 147 countries/regions address adaptation, only 16 identified transport as an area to prioritize in their adaptation actions. Concrete recognition of this area of risk is a key part of a comprehensive vision of climate adaptation. The climate conference in Paris is an opportunity for governments and development partners to bring meat to the bones of transport climate adaptation plans, and include transport in the core of their resilience strategies. The transport community, coming together in support of accelerating action on climate change (#WeAreTransport), is ready.